We come up with Frozen French Fries that are of optimum quality. Our Frozen French Fries is prepared using 100% fresh and pure potatoes at our vendors’ end. In tune with international quality standards, we provide Frozen French Fries in variable-size airtight packaging option in order to retain purity, quality and freshness for a longer period. 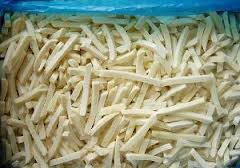 We are one of the prominent Exporters and Suppliers of Frozen French Fries from Thailand.